WESTPORT — Old and new clashed in many of Westport’s top 10 stories from 2017. In some cases, the past was maintained. 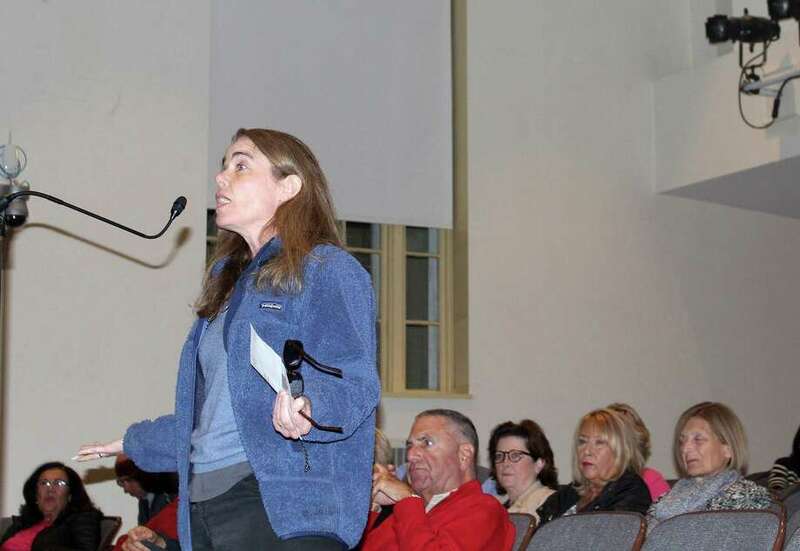 The Representative Town Meeting upheld the town’s 1933 coyote trapping ban; First Selectman Jim Marpe rejected state money to renovate the historic William Cribari Bridge, and the Planning and Zoning Commission denied a proposal for a new six-story apartment building on Wilton Road. Other prominent stories featured a reckoning with the past, and parts of Westport — white privilege, sexual assault and resource scarcity — that had hidden under the surface. As 2018 dawns, here’s a look back at the best stories of 2017. In what many called the most divisive local election in years, incumbent Republican First Selectman Jim Marpe beat out Democratic contender Melissa Kane for another four-year term in the town’s top spot. A flurry of campaign signs filled town streets and perturbed residents. In the end, Democrats swept most of town’s boards and commissions. Michael Cammeyer, Danielle Dobin, and Greg Rutstein, all Democratic candidates for Planning and Zoning, ran an especially notable three-person ticket campaign promising to overhaul town’s primary land-use body. The trio took all three open spots, defeating two other zoning candidates. In August, Marpe voted to reject $42 million in federal and state funding to replace or rehabilitate the 133-year-old bridge saying he didn’t have a clear understanding of the intentions of the state’s plans for the project. The issue divided the town with some residents saying a bridge reconstruction would allow 18-wheelers to enter town and others advocating bridge infrastructure changes will decrease traffic and allow bikes to cross the bridge more easily. In September, the Planning and Zoning Commission unanimously voted to approve construction of two new Aquarion Water Company tanks on North Avenue despite abutting neighbors concerns that the tanks will increase traffic near Staples, change the character of the residential area, and force the neighborhood to bear the brunt of the region’s water demands. Town and state elected officials got involved and are now in the process of helping the neighbors negotiate with Aquarion on what size and shape, if any, the tanks will take come the spring when construction is set to begin. This year’s budget cycle was particularly difficult as a result of the financial issues plaguing Hartford, where the state faced a $1.3 billion deficit. Education funding became an especially contentious topic after the state stripped $1.9 million in Education Cost Sharing Funds for Westport. In May, the RTM approved a $126 million school budget, agreeing to restore money originally cut by the finance board. In addition to a June emergency repair of the beach Pavillion, the Parks and Recreation Commission has responded to residents’complaints about the beach this fall by approving plans for a new sidewalk, bathrooms, and trash cans in addition to changes in the designated parking areas for town emblem holders, single-entry for daily passes, and increased sanitation staffing. What started three years ago as a town-sponsored essay contest to encourage young people to grapple with issues of diversity triggered a tsunami of backlash, and responses, when in March the contest’s chairman, Harold Bailey announced the year’s essay topic: white privilege. Chet Ellis, 15, won the top prize for his essay, “The Colors of Privilege.” Ellis, who is black, said he “never really thought much about white privilege” until his family left New York City and he realized many of his Westport classmates were not aware of the plight African-Americans have endured and continue to encounter. October articles in The New York Times and The New Yorker revealed Harvey Weinstein, who owns several residential properties in town, paid off sexual harassment accusers for decades. After the initial reports, more than 30 women came forward alleging Weinstein sexually harassed or assaulted them. Two of the women, Sarah Ann Masse and Lupita Nyong’o, say Weinstein sexually harassed them in Westport. The P&Z unanimously rejected a proposal, brought by Garden Homes Management, for a six-story apartment building with “affordable” units on Wilton Road in February. In August, an appeal by the project’s developer was definitively shot down in court. To date, Westport lags behind neighboring Darien and New Canaan in affordable housing, according to state requirements. Seniors claimed a big win when the RTM voted in July to approve a $3.9 million renovation project for the Westport Center for Senior Activities at 21 Imperial Ave. Construction on the project, which will increase space for fitness and arts and crafts activities, will commence this winter and will take as long as a year to finish. Westport maintained its status as the only town in the state with a coyote trapping ban after the RTM voted down a petition to allow coyote trapping in town. Many Coleytown residents spoke at the five hours long RTM meeting saying they fear for their children and pets in wake of a more-present coyote population in the neighborhood.